When it comes to finding the right boat covers for Bayliner boats, you cannot go wrong when choosing the boat tops created by Chicago Marine Canvas. Offering the best in marine canvas tops for all types of boats, the ones created for Bayliner are durable, long lasting, and weather resistant and even compliment the appearance of your boat as well. Because of the tough materials used, there will be fewer boat canvas repairs as well. All of this from a simple boat cover that goes back many decades in terms of their service. Today, you can find many covers that are crafted from the best materials to offer the protection your boat deserves. There are a number of benefits that Bayliner boat covers offers for your craft, especially if you live in a climate that will change drastically from summer to winter. Resistance to the Elements: Even if your marine craft features 100% water resistant materials on the top and is under a canopy, it is still vulnerable to the wind, rain and salt water of the ocean. Boat covers provide that extra bit of protection from the elements as well as the salt water spray that otherwise will start to degrade the materials inside your boat. UV Protection: The ultraviolet rays of the sun will damage and fade the materials inside your boat such as the seat fabrics and other elements which means they will need to be replaced. By using boat tops made from UV resistant material, you can prevent that damage from occurring when your boat is not being used. Easy Use: The cover is made for the Bayliner line of boats and is easy to put into place, remove and store when not needed. This means it only takes a few moments to cover your boat and protect it from the elements that will save you a considerable amount of money in terms of maintenance and replacement in the long run. 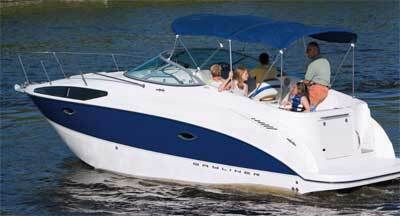 Why Choose Bayliner Boat Covers? Having a specific cover for your brand of boat is important for the overall fit and coverage that it provides. Plus, there are other reasons as well why they are so effective. The marine canvas that covers your boat will last up to a decade or more of normal use before it needs to be replaced. When you consider all the potential damage that it is preventing, this is a rather long period time that it will serve your needs. 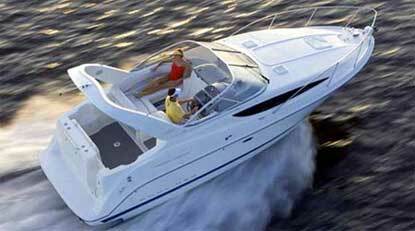 Plus, the boat tops that are used may be custom designed for your crafted meaning that your boat will be measured so that the exact size needed can be constructed. Getting the proper size is important because it will not only be easier to use, but also to store and properly protect your boat as well. Using the right marine canvas to cover your boat that comes in the proper size will add years to the enjoyment of your craft while delaying the replacement of the vulnerable materials inside such as the seat covers and other equipment you have in your boat.